Every dollar that comes your way is a blessing, especially when it comes to trading in the volatile world of bitcoins. Thankfully, Coinbase rewards you for sending much valued customers their way, giving you more money to feed your cryptocurrency trading needs. Coinbase has a rewards program that pays you every time someone signs up with the popular exchange through your referral, so if you hadn't already taken advantage of this nifty program, it's never too late to start sharing. And with so many people joining Coinbase lately, you might as well take advantage of the influx of new users and earn a little money to bolster your funds. Best of all, sharing Coinbase with friends and family is incredibly easy using your favorite browser on Android, iPhone, Mac, or PC. 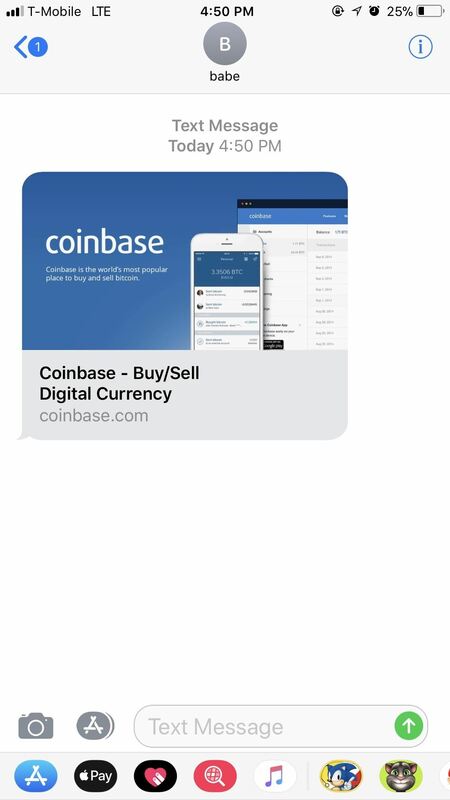 It's worth noting that while this feature can be found within the Coinbase app for Android, it tends to send out a link to the Google Play Store, which wouldn't be ideal if you're sharing with someone using an iPhone. So we recommend going through your web browser to help ensure you snag all potential referrals. 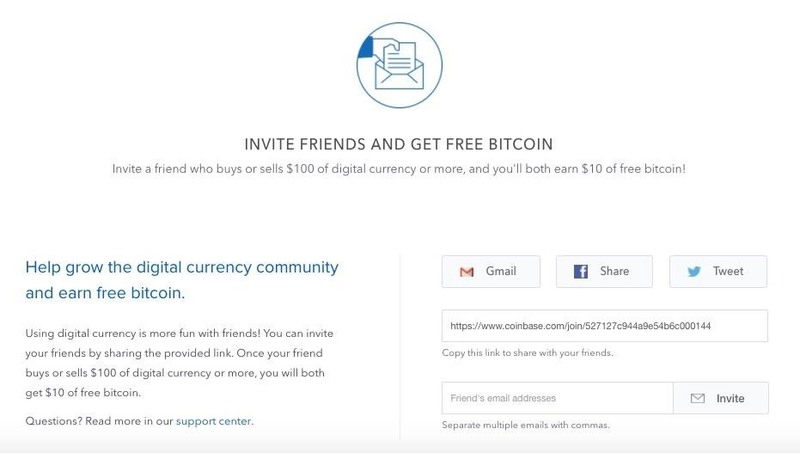 Coinbase rewards you with a commission of $10 worth of BTC every time someone new signs up for an account using the referral link that you've shared and completes either a buy or sell order amounting to at least $100 of BTC, BCC, ETH, and LTC within 180 days of creating his or her account. In addition to this, your referral also gets the same bonus once he or she completes a cryptocurrency purchase or sale amounting to at least $100 within the same 180-day timeframe. A great aspect of this program is that your referral doesn't have to buy or sell $100 or more in cryptocurrencies in one go — as long you as your referral's transactions tally up to at least $100 within 180 days, both of you will earn the $10 bonus. Keep in mind, however, that trades can take up to four business days to complete. So if your referral's trade is performed on day 178 and completes on day 182, neither of you may receive a reward. 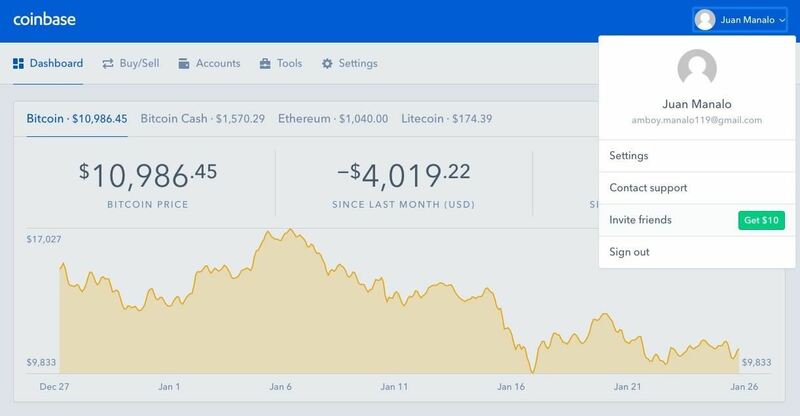 To invite friends, family, and others to sign up for Coinbase using your referral code, sign into Coinbase using the browser on your iPhone, Android, Mac, or PC. From there, click the avatar button in the upper-right corner of the screen, then choose "Invite Friends." Within the invite page, you now have the option of sharing your Coinbase referral link either through email, social media, or copying your personal link to share with friends via text messages (iOS). Choosing either Facebook or Twitter will generate a ready-made post which you can instantly share on your feed for people to view, while invites sent via email or messaging will share your direct referral link. 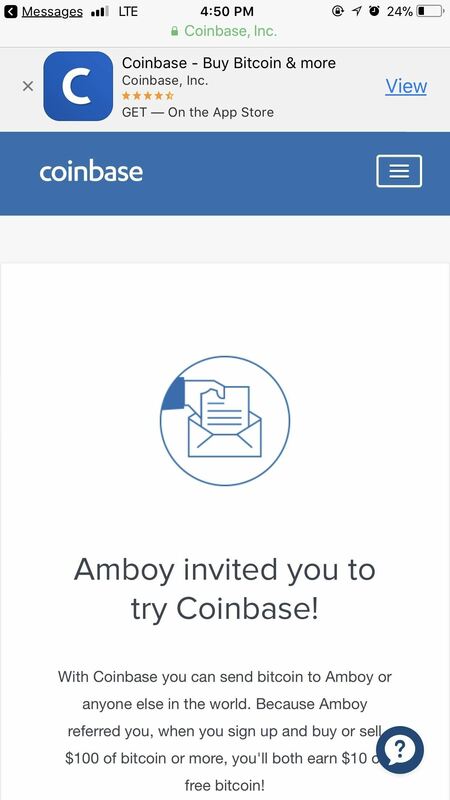 Once you've sent out your invites, all the receiver needs to do is open the link you shared, which will then take them directly to Coinbase. 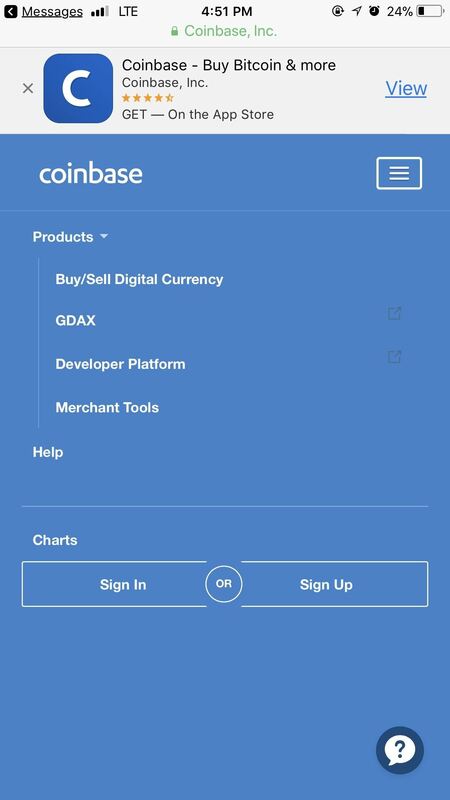 From there, they'll just need to tap on the hamburger menu button ion the upper-right corner to open the menu page, then select "Sign Up" to register with Coinbase. To play it safe, make sure to tell your friends and family to sign up using the browser if they're using a smartphone, as it's currently unknown if your referral code will go through if they download the app and register an account from there. Once your referrals have successfully registered on Coinbase, deposited funds, and have started trading in BTC, LTC, BCC, and ETH, simply sit back and wait until they reach a total amount of at least $100 in trades for both of you to receive your bonuses. Just be sure to remind them to execute those trades within 180 days.